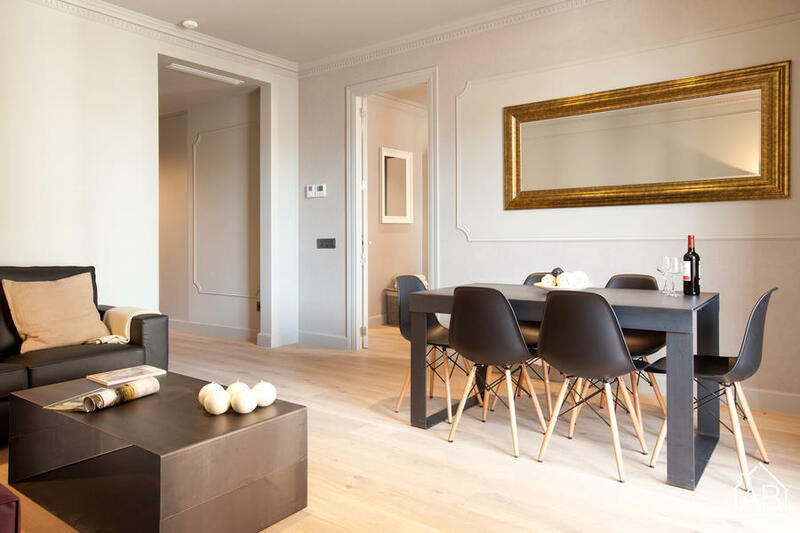 This luxurious apartment with private terrace is located right in the centre of Barcelona. The apartment can be found in the Eixample neighbourhood, home to some of Barcelona’s best restaurants, shopping areas and sights. Just walking distance from a few of the city’s top attractions such as Las Ramblas and Plaça Catalunya, this stylish apartment is in the best location. It is also very well connected by public transport to the rest of Barcelona. This designer apartment is equipped with state-of-the-art facilities throughout. It has a modern décor, complimented by a pop of colour, and can easily accommodate up to 6 people with 3 bedrooms and 2 bathrooms. An Internet connection is provided, too. The kitchen is fully equipped with the highest quality appliances, allowing you to prepare your own dishes just as you would back home. There´s also a dishwasher and washing machine for your convenience. The apartment building itself has been recently renovated and has an experienced 24 hour concierge service to take care of all your needs. The building is also equipped with security cameras throughout. What´s more, you can make the most of the 150m2 communal terrace, complete with sun loungers during your time in this wonderful apartment.